So you’ve just got engaged (congratulations! ), you’ve planned the wedding and found the dress, and now it’s time to start thinking about the honeymoon. It’s got to be romantic, sure. Good food, beautiful beaches… Maybe some waves too? If there’s ever a good time to go all out and really splash out on a trip it’s your honeymoon, so make the most the opportunity! As surfers we’ve got it pretty easy compared to most other sports. Imagine if you were a caver: suggest a honeymoon slithering through dark, damp and muddy holes in Wales and divorce will follow as inevitably as an exaggerated claim follows Medina exiting the barrel. Luckily for us, romance and secluded beaches on remote tropical islands often go hand in hand with great surf destinations. Whether you’re one half of a surfing power couple or your newly beloved doesn’t know their bottom turn from their backside, there are plenty of incredible surf destinations that tick all the necessary boxes and will ensure an unforgettable honeymoon – and trip of a lifetime – for both of you. There are a few absolute essentials when planning any honeymoon: romance, privacy, and a touch of adventure. Your tastes might run to sumptuous ultimate luxury or shoestring adventure, relaxed and familiar surroundings or exotic and wild, lazy and chilled out or crazy and action-packed, but at least a little romance, privacy and adventure is a necessity for a successful honeymoon. That still leaves a pretty broad range of possibilities though, so let’s start to narrow it down a bit. Timing is important. When is the surf season? What’s the weather like then? Yes Portugal gets the most swell in the winter, but you might be disappointed if you hope to sunbathe all day. Sure Bali can get good – and uncrowded – waves during the off season, but are you prepared to deal with the frequent rain? Can you take several weeks of holiday time, or do you need to make the absolute most of the time you have in a shorter trip? Are you and your partner both ok with long haul flights? What about transfer time once you’re on the ground? Idyllic Indian Ocean islands like the Maldives are a quintessential honeymoon destination for very good reason, but they’re not perfect for everyone: depending on where you’re travelling from flights can be long, and once you’ve landed at the main international airport in Male you can still have quite a trip by boat or seaplane to reach your final destination. If you have less time then it makes sense to spend less of it on the road, and have more time left to enjoy yourselves. If you’re within easy reach of Bali then it can be ideal: you can be sipping cocktails overlooking Uluwatu less than half an hour after touching down in Denpasar. Similarly the Canaries are easy to reach from much of Europe, while from America there are many options in El Salvador with relatively short transfers from the airport. If budget is unlimited, the world is your oyster: there are absolutely incredible 5* luxury boutique resorts and glamorous yachts available in all the most fabulous hidden corners of the world. Things are a little trickier if money is tight, but that doesn’t mean you have to settle for an average honeymoon close to home! If you book early you’d be surprised how little flights to exciting destinations like South Africa actually cost, and once on the ground prices are a fraction of what you’d pay at home! Remember it’s not just the upfront costs of travel and accommodation – you also need to consider things like food, alcohol, souvenirs, activities and day trips, insurance, extra treats like massages, etc. While a 5* hotel doesn’t come cheap, romantic accommodation doesn’t have to cost the earth either: there are plenty of gorgeous little eco guesthouses tucked away around the! Accommodation is one of the key elements of a successful honeymoon though, so you really do have to find the right place. Would you prefer a boutique retreat on a remote island, a luxurious no-expense-spared resort, a quiet beach house, or for something really unusual, how about chartering a small yacht in the Maldives and sleeping in a different spot each night? What sort of facilities do you want? Full onsite spa and swimming pool, lively bar and dance floor, gourmet restaurant, room service, private chef, your own kitchen? The options are endless, and only you know what will make your partner really happy. Do you just want to relax on the beach and surf all day, or do you want something more exotic and exciting, with wild culture and incredible sights? Remote islands are undoubtedly beautiful, but they can be a bit lacking on the culture front. In contrast Sri Lanka is like a while new world with so much to do besides surf, and the crazy sounds and smells of Marrakech are a tempting distraction from the surf breaks in Morocco. Do you want to just forget about the world and concentrate on each other, or go out and explore? Would you rather go see out temples and historic landmarks, wander around a local market, take a jungle hike and go whitewater rafting, or check out vibrant city nightlife? What sort of waves do you want to surf? Are the hollow reefs of the Mentawais calling you, or would you prefer to cruise a gentle beach break on a longboard? Do you and your partner both surf to a similar level, or will one of you need lessons in a beginner spot? It’s important to find a destination where everything is close at hand: your partner is bound to get resentful if you disappear off an hour down the coast every day. Ideally you want a selection of breaks close by your accommodation to maximise your chances of good surf in different conditions, and to minimise the amount of time away from your significant other. If you stay right at the break it’s easy to go and grab a few waves before breakfast or in the afternoon and still have lots of time to spend together – it is your honeymoon after all! Are you happy to look after yourselves and do your own thing, or would you like surf lessons and guiding? How about boat trips to nearby breaks, or snorkel and watersports equipment to hire? Is your accommodation easy to get to on public transport, or will you need transfers arranged? Would you like to take yoga classes, or learn how to fish? How about a photography service to record lasting memories? There are so many extra services to think about that it can be quite confusing, but sometimes it’s the little extras that really make the trip! There’s a reason why the Maldives are such a popular honeymoon spot: they are quite simply paradise on earth. Coral atolls rise out the warm and crystal clear Indian Ocean, ringed by gorgeous sandy beaches. The waves are very high quality, but tend to be fun and playful rather than too heavy. The biggest swells and most consistent surf is from May to October, though you can find great waves all year round. There are several private waves in the Maldives, too; whether you believe that wave privatisation is right or wrong, there’s no doubt that less time spent competing for waves means more time left to spend with your partner. Accommodation is available for all budgets, ranging from the most luxurious eco resorts and yachts on the planet to more affordable guesthouses and small boats. 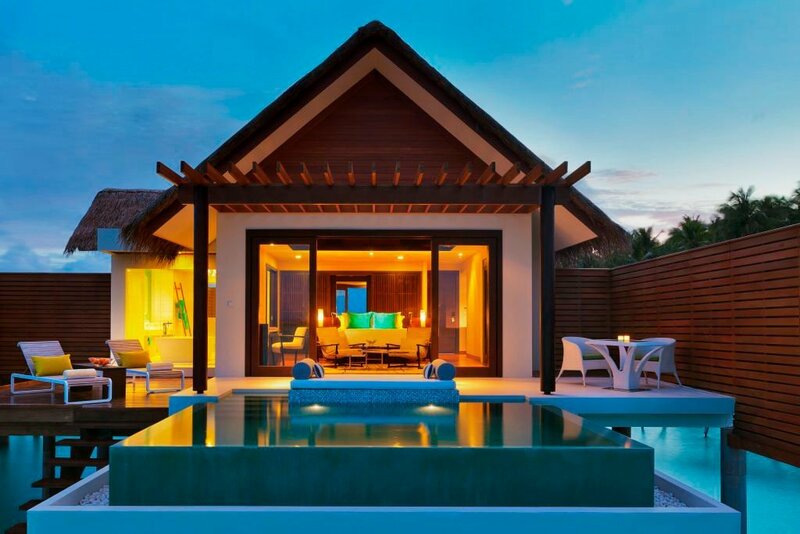 Our top pick for honeymooners in the Maldives is PER AQUUM Niyama, an incredible 5++ star resort on a remote atoll. With a fresh modern design and facilities like an underwater nightclub, Niyama is sure to be a hit with your better half way! There are a choice of breaks just a couple of minutes from the resort, and due to the remote location crowds are at an absolute minimum – so no wasted time floating around in the lineup when you could be riding waves or spending time with your partner. 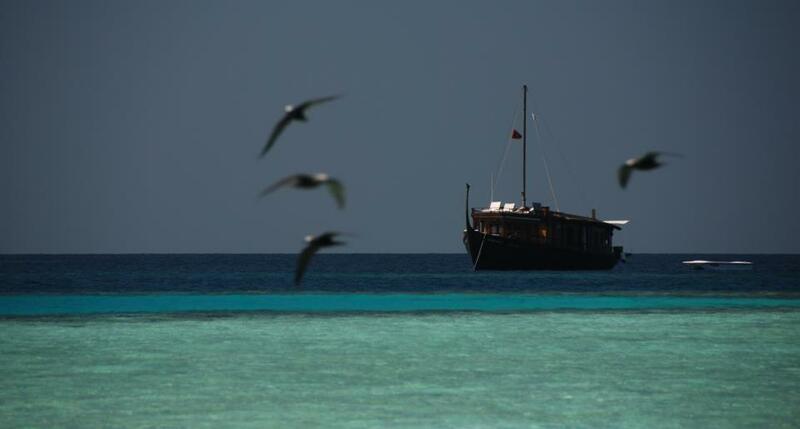 For a truly unique honeymoon in the Maldives, you could consider chartering a surf boat. Boat trips give you the opportunity to move around and explore much more of the fascinating island chain than staying at just one resort – you can cruise over to different surf breaks depending on where is working in the current conditions, or discover totally deserted islands for a romantic moon-lit evening meal on the beach. The boats in the Maldives vary hugely in size and standard, from big open boats like floating hotels to sleekly opulent ultimate luxury yachts. For honeymooners we recommend smaller and more intimate boats like the Stella I and II, which are affordable for just two guests. These new luxury yachts allow you to plan your own itinerary – you can sail anywhere from the consistent Northern Atolls with quality and better known breaks, to the Central Atolls (where you’ll find more than 10 world class and rarely-surfed reef breaks); or to the even more remote Southern Atolls. The prime months to surf the Maldives are June-July for the Northern and Central Atolls, or March/April and September-November for the Southern Atolls. See also our guide to planning surf boat trips if you’re interested in a boat charter for your honeymoon. Bali is often known as the ‘Island of the Gods,’ and is a brilliant honeymoon destination. There is a huge range of accommodation options, from the most exclusive 5* resorts and hotels through boutique lodges, surf camps, private villas and cheap bungalows. Though areas like Kuta are very touristy, it’s always easy to escape the crowds: crazy Indonesian culture isn’t very far below the surface, even in glamourous Seminyak. Bali is also home to some of the most incredible waves on the planet, and there are spots to suit all levels of surfer. Head to the Bukit and the barrel machines of Uluwatu and Bingin if you want to test yourself, or check out relaxed Canggu and the beginner/longboard breaks at Berawa and Batu Bolong for a more chilled out trip. April to October offers the most consistent surf and biggest waves, but the off season can be surprisingly good with far fewer people in the water. The Anantara Uluwatu is one of our favourites for honeymooners in Bali: it lies on the cliffs directly above Impossibles on the Bukit Peninsula, rippling down towards the sea in a series of upmarket villas, penthouses, pools and restaurants; ultimate luxury at its finest. All the best waves of the Bukit are within easy reach, and an array of extra treats and services like spa treatments, yoga classes, elephant safaris, etc are all on hand. The cuisine is world class, and the views from the infinity pools are mind blowing. The Mentawais need no introduction to surfers: this incredible island chain is home to some of the most impossibly perfect waves on the planet. What might surprise you though, is how well they can work for a honeymoon! The Mentawais Islands are very remote, which means privacy is very easy to come by – you’re not going to find hordes of screaming kids here. There are all manner of luxury resorts and quiet retreats in various corners of the archipelago, but secluded beaches and romantic sunsets are common to all of them. The optimum surf season is considered to be from March to November when the long, long distance swellscreated by the Roaring Forties arrive, having traveled all the way from Antarctica. However, this region has consistent, warm water tropical surf all year with wide open swell windows to pick up anything the Indian Ocean chooses to throw at it. Togat Nusa is one of the best spots for honeymooners. It’s an incredibly relaxed retreat from the world, and as just 6 guests stay on the island at a time, privacy is guaranteed. It’s not the most lively place in the world, but if you’re seeking a quiet sanctuary to spend quality time together, surf incredible waves and practise yoga on the beach, it’s hard to beat. The food is all locally sourced and freshly prepared, and there are a range of extra activities to enjoy like snorkelling, fishing, and the opportunity to visit a local village. Everyone should visit Sri Lanka at least once in their lives, but it makes a particularly good destination for honeymooners – and even better, it’s one of the most affordable! It goes without saying that this Indian Ocean jewel has great surf, but it has a particularly wide range of beginner and intermediate spots: if you want to share the joy of surfing with your partner, Sri Lanka’s warm (average 28°C) waters are about the most perfect place to do so. Sri Lanka is an island of two halves, split by the east-west monsoon patterns: the monsoon hits the south-west of the island from April-September, and the north-east from November-March. The dry season typically brings offshore winds to the Hikkaduwa and Midigama region (the hub of surf culture in Sri Lanka) on the South West coast during the Northern Hemisphere winter, which then groom long distance Indian Ocean groundswells into seriously fun waves. 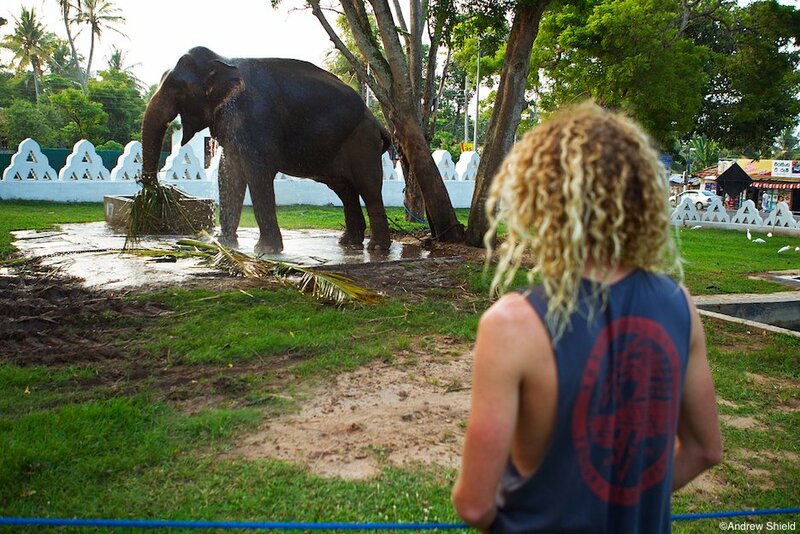 There is so much to do in Sri Lanka aside from surfing too: its a fascinating and varied country with incredible culture, and home to a wide array of religions, ethnic groups and languages; it also has the highest biodiversity density in Asia and exotic wildlife. You can go on jungle hikes and spot wild elephants and monkeys, visit national parks and tea plantations, climb Adam’s Peak (2243m) to search for Buddha’s footprint, and so much more. Sri Lanka is one of the most affordable exotic destinations around – food is super cheap, and a beer costs less than $2. This affordability is reflected in accommodation prices too. For honeymooners on a tight budget, The Green Rooms at just $17 pp/night are almost impossible to beat! You stay in one of just four cute bungalows right on the beach, so peace and quiet is guaranteed; the surrounding palm trees offer additional privacy too. In the morning you can surf right in front of your bungalow, or head further afield to explore somewhere new. If you can stretch your budget a little further, then high-end luxury in Sri Lanka is also much more affordable than elsewhere in the world. 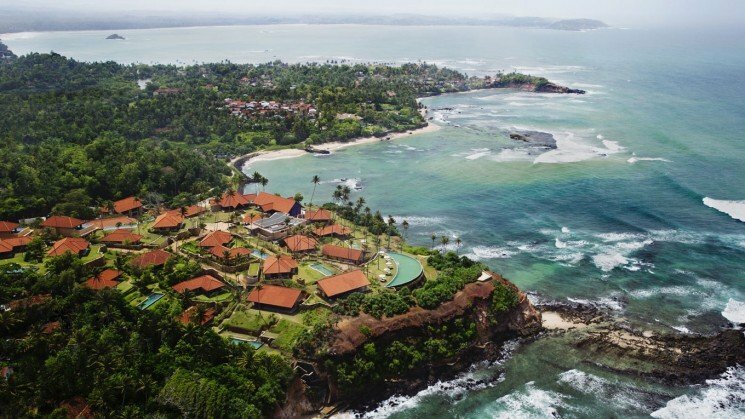 The Cape Weligama is the epitome of elegant Sri Lankan luxury and exclusivity, starting from just $140 pp/night! The resort is set in its own private 12 acres of land on the end of a prominent headland overlooking an incredible and un-crowded reef break. After an exciting day surfing or exploring, you can unwind by the Moon Pool – an impressive 60-metre crescent-shaped icon that sits on the southern-most aspect of the resort overlooking the Indian Ocean. Order drinks from the Moon Bar and sip on a cocktail as the tropical sun sets below the horizon. Bliss. Central America is a feast for the senses and the stomach with rich cultural influences, delicious food and stunning natural attractions. A land of volcanoes and rainforest, evocative ancient Maya ruins, beautiful tropical beaches and warm hospitality, it’s an ideal honeymoon destination. The surf in Central America is spectacular too, with a diverse choice of wave type and the opportunity to choose between two distinctly different bodies of water – the Pacific Ocean and the Caribbean. You can surf mellow fun waves right through to shallow sucky reefs all year round, in board short warm water. Costa Rica’s Pacific coast offers a range of beach breaks, river-mouths, points, reefs and outer reefs, typified by off-shores in the morning. The largest swells arriving during the gentle monsoon season of May to November. December to April is dry season (and called summer even though it is in the Northern Hemisphere), typified by smaller NW swells. Nicaragua’s Pacific coast receives consistent swell with offshore conditions for most of the year, with some excellent left-hand beach and point breaks. El Salvador’s south facing coast can only receive S-SW swells. Though these are consistent year round, March through October usually offers the biggest swells, and offshore winds are typical in the mornings. Rancho Santana in Nicaragua is one of the best options in Central America for honeymoons. Set serenely in the Southwest Pacific and less than three hours from Nicaragua’s capital city of Managua by car, the property has grown into a quiet community that enjoys purity, authenticity, and a rustic elegance. Both residential and resort, “the ranch” boasts over 2,700 acres of majestic land along two miles of shoreline which include five unique beaches; there’s so much to see and do it’s impossible to list it all here. The accommodation is luxurious, there are a variety of great waves nearby, and there’s sunshine and warm water all year round. Another unique honeymoon option in Central America is Dreamsea Surf Camp in Costa Rica. 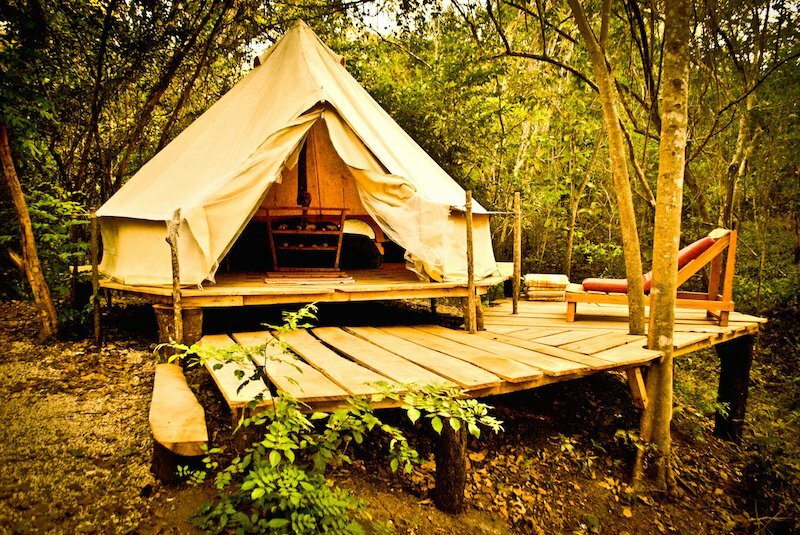 Located in Tamarindo Bay in the Guanacaste region, the accommodation at Dreamsea Surf Camp is in tents, but far from ordinary tents: we’re talking full scale ‘glamping.’ If you typically associate camping with roughing it then Dreamsea Surf Camp’s experience is going to make you redefine your ideas. 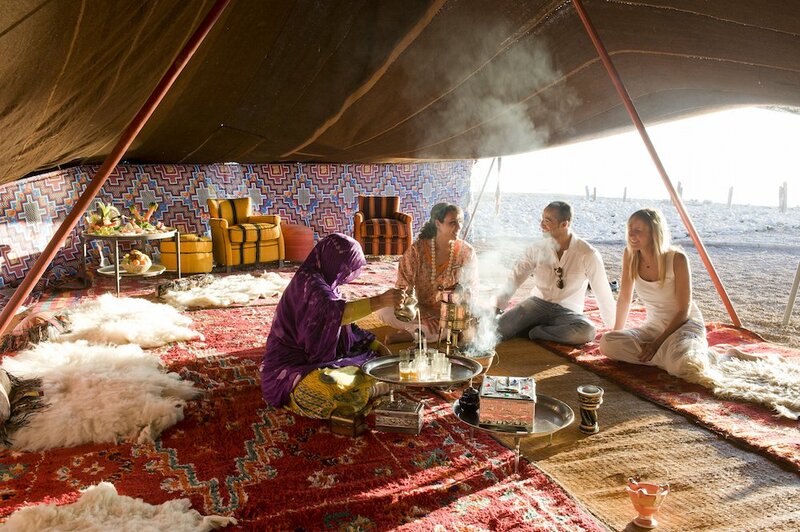 The tents are gorgeous and very well appointed, perfectly combining natural living and a real connection with nature with a good serving of luxury. Morocco is a great choice for surf honeymooners on a budget, who still want something a bit exotic and adventurous. Despite its proximity to Europe, Morocco is very definitely part of Africa! It’s a land of mosques and markets, kaleidoscopic colours and fascinating smells and sounds. The best surf and biggest waves are in the winter months, from October to March, though conditions can be excellent at any time of year. Though the waves can be flawlessly perfect and at times powerful, they tend to break over sand or flat rock – ideal for intermediate surfers who want to push themselves a bit. Aside from the surf, Morocco is filled with exciting and stimulating sights to see: you can haggle in the markets in Marrakech, visit historical mosques and fortresses, and even go camel trekking and sandboarding in the Sahara desert! Paradis Plage resort is the ultimate surf honeymoon destination in Morocco: it’s a 30,000sqm oasis of sumptuous luxury, with sophisticated yoga and spa facilities, plus an in house team of surf instructors. You can customise your package to build your dream trip, and choose from private suites to whole villas to ensure romantic time alone with your partner. 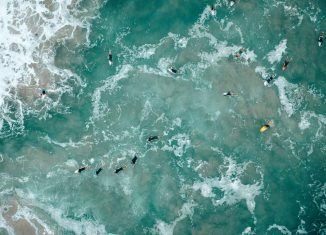 Beach holidays in Spain are more typically associated with sunbathing on the Mediterranean coast than surfing: France and Portugal are often the first destinations that come to mind for European surfing. However, with over 4000km of coastline Spain has great surfing year round, with some truly incredible world class waves like Mundaka, though September to April sees the biggest and most consistent swells. With a warm climate, rich culture and history, and some of the best food known to man, Spain is an excellent honeymoon surf choice with lots to see and do in the water and out; even better, it’s very accessible and easy to get to from most of Europe! Dreamsea Surf Camps have the perfect Spanish setup at San Vicente de la Barquera in the fishing village of Cantabria, in the north west of the country; the snowy peaks of the ‘Picos de Europa’ in the background contrast beautifully with the stunning beaches. The local surf spots are mostly beach breaks, which though can get big at times, are perfect for surfers of all abilities and even first timers. 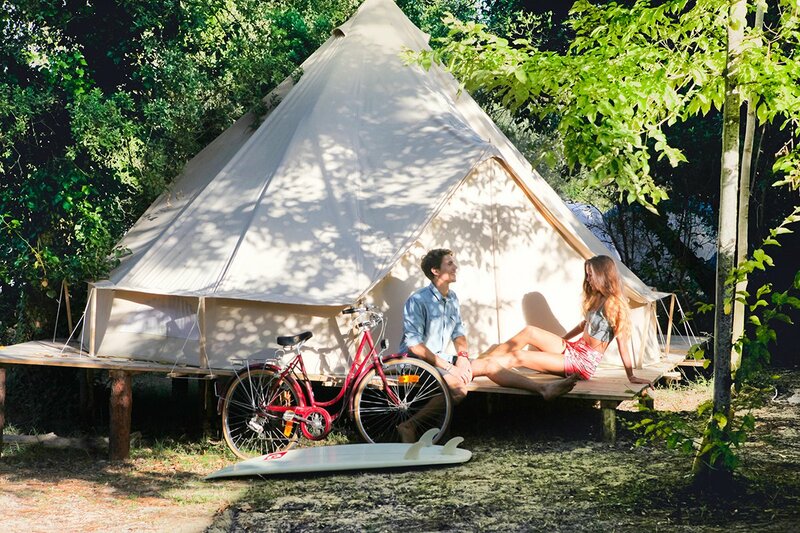 Dreamsea offer the full ‘glamping’ experience in comfortable fully-equipped (including electricity and lighting) tepee tents. They’re perfect for couples and honeymooners – a truly unique romantic and private retreat. 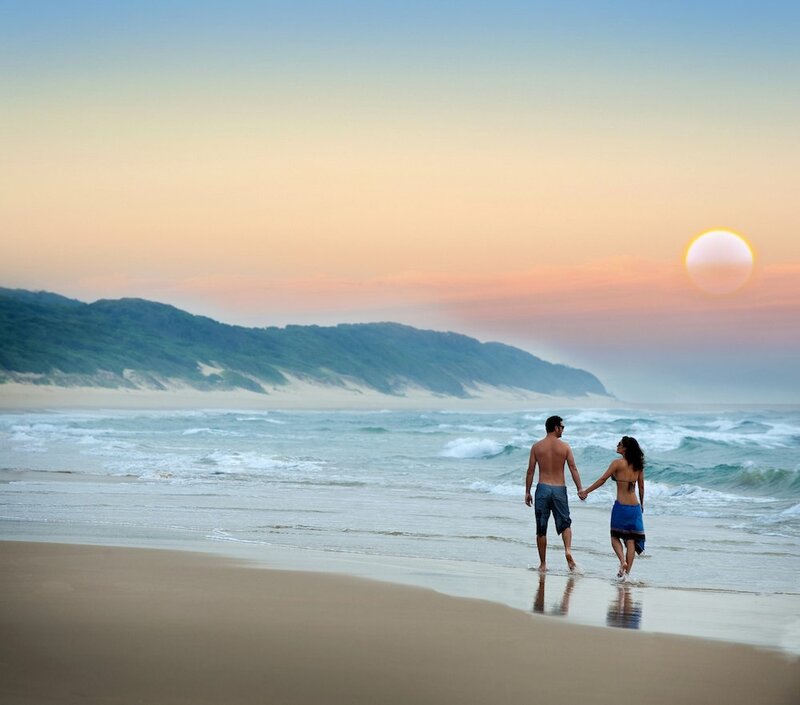 Mozambique isn’t on many people’s travel radar, but it really is an excellent honeymoon destination! Warm Indian Ocean waves lap beautiful palm-fringed sandy beaches, shoals of colourful fish swarm around the graceful local dhow boats, and lions and elephants prowl the extensive bush; if a combination of surf and safari appeals for your honeymoon, then look no further! 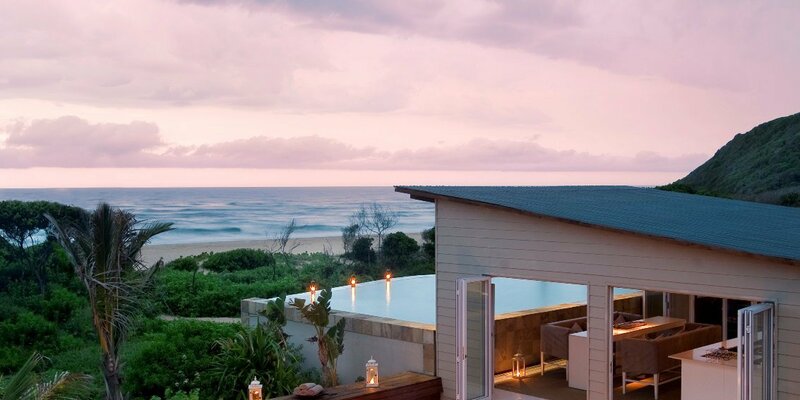 There is one destination in Mozambique that really stands out for honeymooners – the White Pearl Resort. As the name suggests, it’s an absolute African gem. The fresh design and contemporary architecture of the resort perfectly complement the natural beauty oft he surroundings, harmoniously blending into the sand dunes and wild African bush. Surfers of all levels will find waves to suit at Ponta Mamoli, White Pearl’s private beach, but the long peeling barrels of Ponta o Ouro (described as ‚JBay without the crowds) aren’t far away either. Accommodation includes personal butler service and private decks complete with pool. Many extra servcies are available, including romantic meals for two on the beach and even safaris! Need more advice on romantic surf trips and honeymoon destinations? Get in touch with our surf travel experts and together we’ll start crafting your dream honeymoon today!